Aircon Hire Ltd operate from our warehouse in Balham, London SW12. From there we provide a fast and efficient hire service for London and the surrounding area. Our published prices are lower than any others we can find for quiet office cooling and powerful air conditioners for server rooms. Low cost air conditioning hire. We offer a wide range of air conditioner products available for hire. There are many advantages of air conditioner hire over purchase. These include a comprehensive service from initial analysis of the most appropriate equipment for you, right through to servicing and replacement/exchange as necessary to meet your changing needs. Our applications for air conditioner hire include Offices, Events and Server rooms. Server rooms without installed air conditioning can overheat and cause equipment failure in the summer when surrounding office temperatures rise. To be suitable for this application temporary air conditioners need to be able to run continuously without attention. We can normally find a suitable solution at reasonable cost in all situations. Where a longer term solution is needed we can meet the continuous server cooling load with standby facilities where needed. In emergencies we can often be on site within a couple of hours with a van full of eequipment to find the right solution in a hurry. We can visit you and recommend the best solution for server cooling for you. Our Monobloc portable air conditioning hire units are fully mobile and can be positioned where needed most which provides great flexibility and versatility for office areas. Monobloc Units come with different specifications and through discussion we will identify the best unit to suit your needs. Our products are energy efficient with cooling outputs of 2.4KW to 5 KW whilst being quiet enough for general office use. 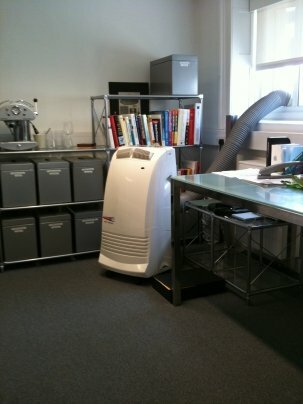 For further information on units for office use, please visit our portable air conditioning hire section. We have a range of heaters for hire suitable for commercial use in office, warehouses and production areas. Our heater hire fleet includes both convector type heaters for offices and radiant heaters for local heating in larger areas. All operate from a standard 13amp wall socket power supply. Click the link heater hire for product and pricing information. For drying out rooms we provide a dehumidifier hire service. Our range of machines are cover smaller domestic applications and larger commercial and flood repair projects. If you have a damp problem then talk to us. We can provide units designed for continuous operation with automatic water disposal or collection of water for monitoring progress in drying. Please click the link dehumidifier hire for more information. There are two main types of portable air conditioning unit. The split type (shown on this website) has an indoor unit which passes air across a cold coil to cool it. By re-circulating in the room through the coil the temperature of the room is reduced. Refrigerant is circulated between this indoor unit and an outdoor unit to carry the heat outside. The coil in the outdoor unit is hot and through the fan assisted circulation across this coil the heat from the room is dissipated outside. As the room air passes across the cold coil moisture is condensed out on the coil and this condensate is collected in a tray for disposal, normally by pumping to the outdoor unit where it is discharged. In this way the humidity in the room is reduced, contributing to the comfort levels for occupants in line with the psychrometric analysis. The other type of portable air conditioning unit is a monobloc unit. This is also displayed on this website. As the name implies, that the whole unit is contained in a single cabinet. The principal difference in operation is that heat is discharged from the room by a warm exhaust hose taken to a window or other outlet from the room. In this way the heat from the room is discharged outside. The cooling output is measured in either Kilowatts or BTU/hr. The conversion from one to the other is that there are 3412 BTU/hr is a Kilowatt. Units which will operate from standard 13amp wall sockets range from 2.6 KW up to 10.3 KW. Units intended for general office or domestic use are normally below 5 KW with the larger units being more industrial and noisier. Typical insatllations can be found in our case studies section. Air conditioning units as described above should not be confused with evaporative coolers. All conditioning moves heat from inside the cooled area and discharges that heat elsewhere. An evaporative cooler does not do this but should be used where sufficient ventilation is available for a high turnover of the atmosphere in the cooled area. The more simple evaporative cooler should not be confused with an air conditioner though it can be very effective when operating in low humidities. Evaporative cooling is simply a fan which blows through a wet filter to evaporate water into the flow from the fan, so reducing the temperature. The atmosphere passing through the evaporative cooler has moisture added and in an eclosed space it will become very humid to the point where the cooler will stop functioning as a cooler and become only a fan. Evaporative coolers should therefore only be used in very well ventilated areas. This makes them unsuitable for office or server room use. They are very useful to provide spot cooling of people working outside and for cooling areas such as marquees where the use of a large fan and a lot of air movement will not be a problem.